East Preston Football Club suffered a first defeat in five Southern Combination League Premier Division matches on Saturday. First-half goals from forward Melford Simpson and Karl Akehurst helped league leaders Haywards Heath Town to a 2-0 victory at The Lashmar. The win was an eighth in a row for table-toppers Haywards Heath, who remain a point clear at the top. On a difficult playing surface making any decent football almost impossible, both teams provided a competitive match. The vastly experienced Haywards Heath side would take the points, converting two chances in an otherwise even first half. East Preston goalkeeper Ben Purkis was called into action after five minutes. Heath’s big centre forward Simpson was put through but Purkis was out quick, closing down the angle and making a good save. Haywards Heath scored their first goal on 15 minutes. From a long throw East Preston failed to pick up Simpson who collected the ball, swung his right foot and somehow it went across Purkis and into the corner of the net. Most efforts were missing the target, except for a cross that Purkis pushed onto the crossbar before it was hooked to safety. Heath added a second a minute before the break through Akehurst to put them in command. East Preston were much better in the second half saw more of the ball. Home goalkeeper Purkis was not really troubled. The best chance of the half fell to EP’s Luke Brodie who from a Jake Heryet free-kick was put through on the right but saw his shot cleared on the line. 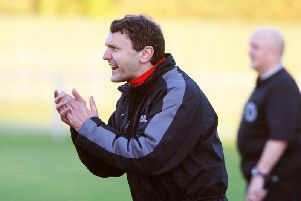 East Preston boss Bob Paine had no complaints following the defeat. He said: “It was a tough game for us against a very experienced side, who are going well at the moment. “Having watched the video back, I thought we could have done better on both goals but we competed well generally and were much better in the second half. It was disappointing to concede the second goal so close to half time, which gave us a mountain to climb. East Preston make the trip to title-chasing Three Bridges on Saturday. EAST PRESTON: Purkis; DaCosta, Etherington, Lyne, Beaney; Searle, Gilbertson; Heryet, Quirke, Hunter; Brodie. Subs: Huet (Gilbertson, 44), Lelliott (Quirke, 56), Laughlin (Brodie, 86), Crook, Josh Parazo.